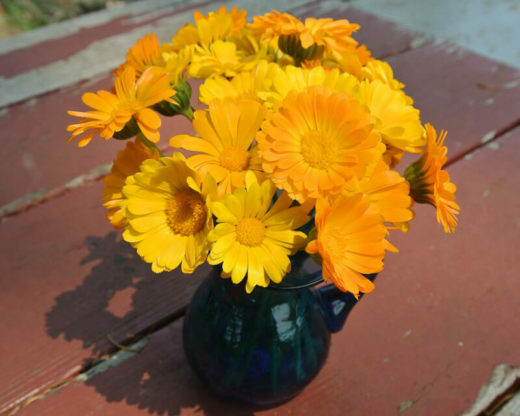 A very fine strain of calendula for medicinal use, and as a self-sowing, short-lived perennial flower. 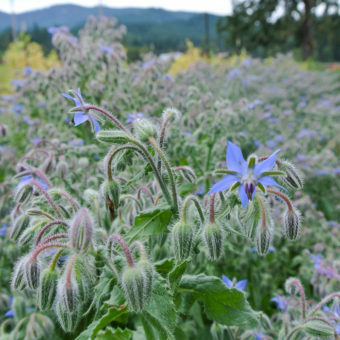 Highly productive plants produce medium-sized flowers with two rows of resin-rich petals. 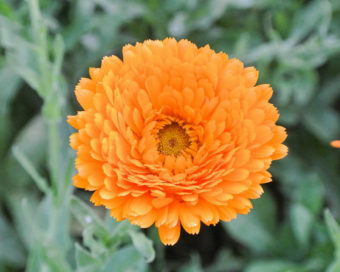 Plants have either soft orange or bright yellow flowers with small centers. Fairly hardy in our climate, Resina often overwinters to produce very early blooms in the spring and even an occasional bloom in the dead of winter if growing in a sheltered location. We love to sprinkle our salads with their edible, aromatic petals. The rich, soothing properties noticeably soften the skin from simply picking flowers. Often called Pot Marigold in England. Direct sow 1/2” deep very early in the spring or in the fall to overwinter plants for early blooms. Thin plants to 6-12”. Prefers 60-70°F soil temp. Germination in 10-20 days. Collect seeds from seed heads that are fully dry. Shell by hand or by dancing, winnow to clean. Finish air-drying if necessary before sealing in airtight container. Some cross-pollination may occur, isolate from varieties of the same species by 1/4 mile.